Doors open at 8:45a.m. Performance starts at 9a.m. This energetic family music is all about fun, movement, and laughter! Mr. Jon is a top seller CDbaby.com, and also won a Parents’ Choice Award, and he now plays over 100 shows a year. 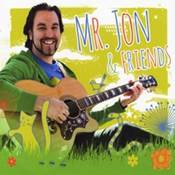 Mr. Jon & Friends makes music for kids and their families that inspire fun, laughter, and dancing. The music of Mr. Jon & Friends is sure to bring a smile to your face! Early Education Open House (pre-k-1st grade) at10a.m.- If you would like to take the opportunity to tour the school, visit the classrooms, and meet the teachers. For questions or to RSVP, email Kathy Kinsey at kkinsey@sjrcs.org. Fall Open House Open House- Sunday, October 28th, 1-3p.m. Catholic Schools Week Open House- Wednesday, January 30th, 9-11a.m. Walk-In Wednesdays - Prospective Parents may visit us each Wednesday between 9 a.m.-11 a.m. for a tour. Additional times may be arranged by appointment. Arrangements may be made for a prospective student in grades 1-8 to shadow with a St. John student, of the same grade, for a day. We know your time is valuable and you may have other commitments. Our open houses for prospective families offer "tours on-demand" - arrive when it is convenient for you during the Open House timeframe, and we would be happy to share our school with you. Children are always welcome to accompany you on a tour. Applications will be accepted for the 2018-19 school year at the first open house will be held in October. Please contact Kathy Kinsey the Director of Enrollment at 301-662-6722 or kkinsey@sjrcs.org to schedule a tour or shadow day.